The hope of winning big. It’s all happening with GrabOne’s Golden Ticket! 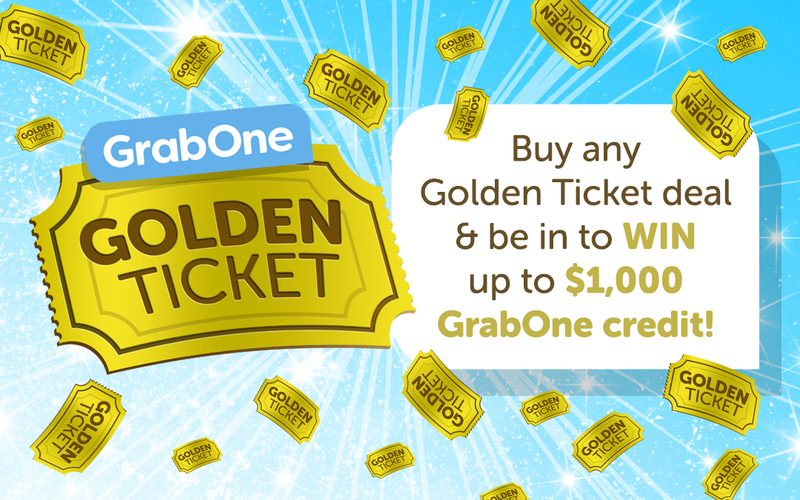 From the 1st to the 14th of June, we’re giving you the chance to win a GrabOne Golden Ticket worth up to $1,000 in GrabOne credit! Simply buy any deal specially marked with a Golden Ticket and you’ll be in the draw to win. Enter by purchasing any deal from our Golden Ticket collection that has been specially marked with a Golden Ticket between Friday 1st June and Thursday 14th June 2018. There are fourteen GrabOne Golden Tickets to be won in total, valued at $500, $750 or $1,000, with one available to be won each day between Friday 1st June and Thursday 14th June. Multiple purchases of Golden Ticket deals are allowed and will count as separate entries for the respective draw. The draw will be made by 4.00pm the following day, and the winner will be notified by email by 5.00pm that day. The prize will be credited to the GrabOne account used by the winner to purchase the deal within 2 weeks of the draw being made. The prize may not be substituted, transferred or on-sold. GrabOne Ltd may in its sole discretion disqualify any entrant who it believes has attempted to or has subverted the registration and entry process. Employees of GrabOne, NZME. or any of the businesses supplying a prize, are not eligible to enter. The prize is neither transferable nor redeemable for cash. The Promoter and any other agencies associated with this promotion will not be responsible for any late, lost or misdirected entries nor for any problems with any computer network, lines, servers, Internet providers or traffic congestion on any computer network, including any injury or damage to a participant or any other person’s computer related to or resulting from participation in this promotion. By entering the promotion, unless otherwise advised, entrants agree that their name, town/suburb and photograph may be used for publicity purposes in connection with this promotion in any media, without any further reference, payment or other compensation to the entrant. The Promoter and any other agencies associated with this promotion will not be liable for any loss or damage whatsoever which is sustained (directly or indirectly) or for any personal injury suffered or sustained by any entrant or prize winners in connection with entering this competition or accepting any prize, except for any liability which cannot be excluded by law. If for any reason this promotion is not capable of running as planned, whether caused by infection by computer virus, bugs, tampering, unauthorised intervention, fraud, technical failures, legal impossibility or any other cause beyond the control of the Promoter which corrupts or affects the administration, security, fairness or integrity of the promotion, the Promoter reserves the right in its sole discretion, to cancel, terminate, modify or suspend the promotion.